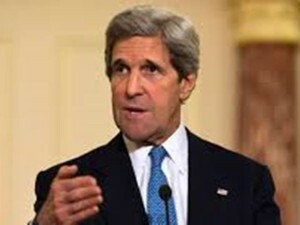 US Secretary of State, Mr. John Kerry, yesterday said that President Muhammadu Buhari is capable of flushing corruption out of Nigeria. John Kerry made this remark during a bilateral meeting he had with President Buhari at the Department of State in Washington, DC, during his four-day working visit. Kerry said the United States government would do all it could to support the president’s fight against corruption and corrupt leaders, both past and current. He added that the decision of the president to bring a very significant delegation with a number of governors to Washington D.C. for the working visit showed his ability to introduce reforms. “And I might mention the president is deeply committed to tackling the problem of corruption, which has prevented the country from doing many of the developmental and other initiatives that are on the table” he added. Speaking further, Secretary Kerry described Nigeria as an important country, stressing that both countries had very important interests together. “Nigeria is an extraordinary important country. We have pledged with the president’s meeting yesterday to work very closely on development of the economy, on counterterrorism, on regional issues, but, very importantly also, to join together in an effort to do a better job of taking on Boko Haram. “The president is deeply committed to this endeavour. He has a military background. He has himself been in combat. He has led the armed forces of his country and he knows what this is going to take. “So we have a ready and willing partner, and we look forward to developing our counterterrorism and our counter-Boko Haram plans even as we also work on energy development, on education, health, and other issues within the country,” Kerry said.